North Korea says its firing of a missile over Japan was "the first step" of military operations in the Pacific, signalling plans for more launches. State media also repeated threats to the US Pacific island of Guam, which it called "an advanced base of invasion". The missile launched on Tuesday crossed Japan's northern Hokkaido island, triggering public alerts to take cover, before landing in the sea. Meeting late on Tuesday in New York, the council called the launch "outrageous", demanding North Korea cease all missile testing. While the statement said the regime's actions were a threat to all UN member states, it did not threaten new sanctions against Pyongyang. Russia and China said US military activity in the region was partly to blame for the increase in tensions, and urged negotiations. Arriving for a visit to Japan, British Prime Minister Theresa May on Wednesday called on China to put more pressure on North Korea, saying that Beijing had a key role in the international response to Pyongyang's "reckless provocation". North Korea: What does 'provocative' test show? North Korea has repeatedly conducted missile launches in recent months, despite being barred from doing so under UN rules. 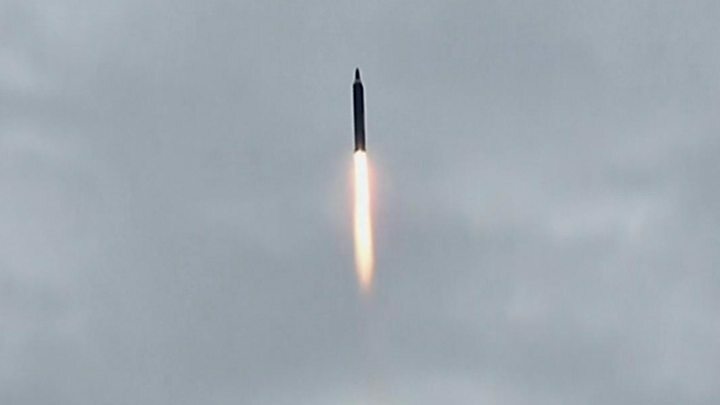 The latest, a domestically made Hwasong-12, was launched early on Tuesday Korean time from a site near Pyongyang. It travelled some 2,700km (1,678 miles), at an unusually low height for North Korean missile tests, over Hokkaido before crashing about 1,180km off Japan's eastern coast. Japan sent out alerts telling people in Hokkaido to take cover. Prime Minister Shinzo Abe later called it "unprecedented, serious and a grave threat". For the first time, North Korea's official news agency KCNA admitted deliberately firing a ballistic missile across Japan. Previous projectiles which crossed the mainland were later claimed to have been satellite launches. It said the launch was in direct response to joint US-South Korean military drills which are currently taking place, as well as to mark the anniversary of the Japan-Korea treaty of 1910, which saw Japanese forces annex the Korean peninsula. KCNA, quoting leader Kim Jong-un, said that, "like a real war", the latest drill was "the first step of the military operation of the KPA [Korean People's Army] in the Pacific and a meaningful prelude to containing Guam". Mr Kim has also ordered more rocket drills targeting the region, it said. North Korea first threatened to fire missiles towards Guam - a major US military centre in the Pacific and where some 160,000 US citizens live - earlier this month. US officials had suggested that the fact it had not carried out its threat so far was a sign of possible progress. US President Donald Trump, in a statement released by the White House, said the world had "received North Korea's latest message loud and clear". "This regime has signalled its contempt for its neighbours, for all members of the United Nations, and for minimum standards of acceptable international behaviour," he said. "Threatening and destabilising actions only increase the North Korean regime's isolation in the region and among all nations of the world. All options are on the table." Earlier this month, President Trump warned Pyongyang would face "fire and fury" if it continued to threaten the US.